The MSR Hubba Hubba NX has been one of the most popular tents in the backpacking world for many years, and with good reason. It's a well-designed, lightweight, roomy, and durable tent that provides excellent protection in windy, wet weather. The symmetrical layout and near-vertical sidewalls on the Hubba Hubba provide a lot of interior space for two hikers to sit up and hang out. 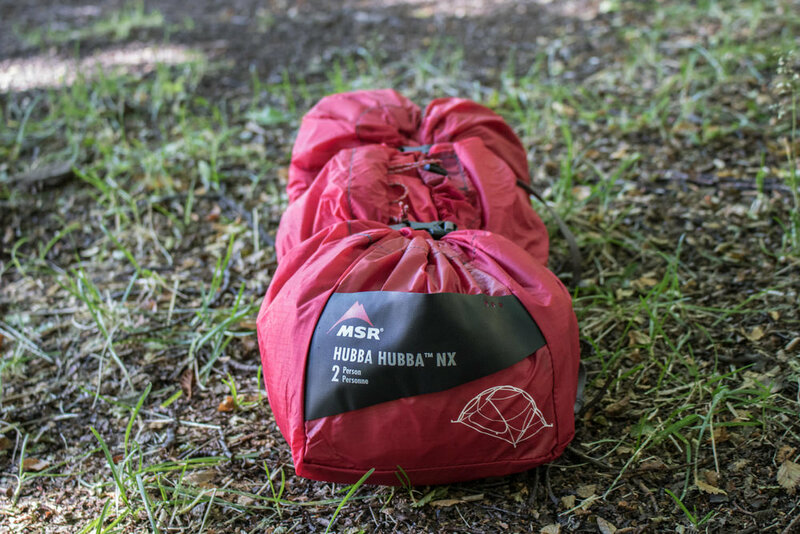 In our opinion, the MSR Hubba Hubba is one of the most balanced backpacking tents on the market. Check out our best backpacking tents list to see how the Hubba Hubba stacks up against the competition. Also, if you like this review, check out the CleverHiker Gear Guide, which is full of content like this. 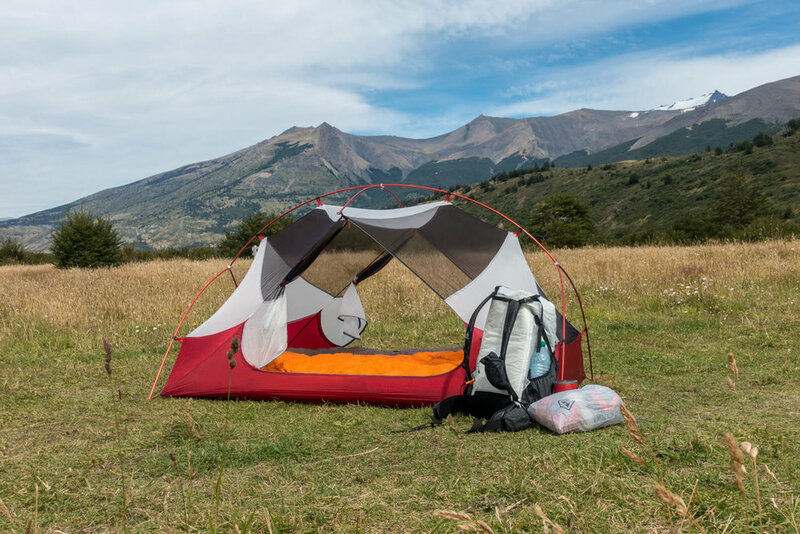 DESIGN - The Hubba Hubba NX is a 2-person, 3-season, freestanding backpacking tent with 2 doors, 2 vestibules, 2 interior pockets, and a top crossbar pole design, which creates nearly vertical side walls. For those wanting more or less space, MSR also makes this tent in 1-person, 3-person, and 4-person models. WEIGHT - The packed weight of the Hubba Hubba NX (this measurement includes stakes, guylines, and all the things you’ll actually carry on the trail) is 3 lbs. 13 oz. When the weight is split between two hikers, each will carry just under 2 pounds, which is pretty good. For 2-person, freestanding, double wall tents, this puts the Hubba Hubba among the lightest options, but not the frontrunner. PRICE - We consider the Hubba Hubba NX as a mid-to-high end tent. Some tents in its class cost more, and some cost less, but considering the Hubba Hubba’s weight, quality construction, smart design, and durability, we think it’s a great value buy. Pricing can change, so for current offers, check out these links to the Hubba Hubba NX at our favorite sellers: REI, Amazon, Backcountry, Moosejaw, Campsaver. DIMENSIONS - The Hubba Hubba NX has a fully rectangular floor measuring 84 x 50 inches. It has a peak height of 39 inches and provides a lot of headroom when sitting up. It has medium-size vestibules measuring 17.5 sq feet and packs down very small to about 6 x 18 inches. MATERIALS - The Hubba Hubba’s tent floor is constructed with 30-denier ripstop nylon. The “denier” refers to the thickness of the fabric, and 30-denier provides a good balance between weight and durability. The rainfly on the Hubba Hubba is made of 20-denier ripstop nylon, which is also a good choice for lightweight rainfly durability. The high-quality, sturdy pole set of the Hubba Hubba is built with DAC aluminum, yet another good choice. MSR - Annie and I had the pleasure of touring MSR’s headquarters last year and we walked away very impressed with their attention to detail and quality craftsmanship. 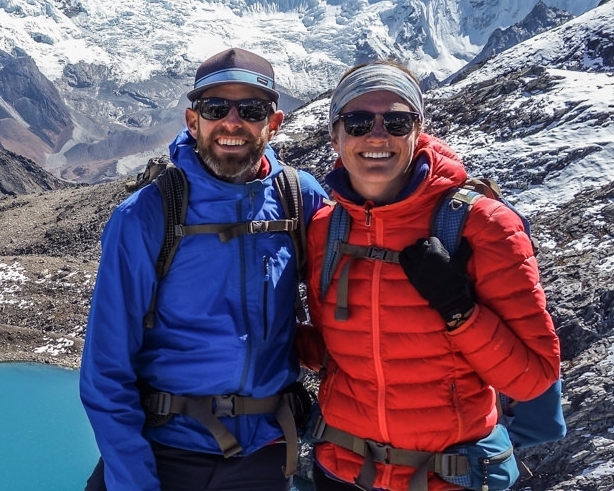 In our opinion, MSR creates some of the most durable, well-researched, and well-tested gear in the outdoor industry. That doesn’t mean that every one of their products is a homerun, but in general we have a very high level of respect for MSR products. The photos below show the Hubba Hubba NX in action on a recent month-long trip through Patagonia. We experienced lots of wet weather and high winds on our journey and the Hubba Hubba handled the conditions with ease. Also included in these photos is some gear from our best sleeping bags list and best sleeping pads list: the REI Flash pad, Nemo Tensor pad (wide), Feathered Friends Egret 20 UL, and Katabatic Gear Flex 22. Note: when viewing photos with sleeping pads, one pad is normal size and one is wide. MSR QUALITY - Like many of the MSR products we’ve tested, we feel the Hubba Hubba NX shows a dedication to quality craftsmanship, materials, field testing, and is backed by a solid warranty. DESIGN - The Hubba Hubba NX has a design that maximizes convenience and space for the most common backpacking adventures: 2-person, 3-season, freestanding, 2 doors, 2 vestibules, 2 interior pockets, and a top crossbar to create vertical walls. WEATHER PROTECTION - We’ve found the Hubba Hubba NX to be very sturdy and waterproof in rough, windy weather. With all its guylines deployed, we consider this one of the sturdiest lightweight tents we’ve ever tested, hands down. INTERIOR SPACE - The pole design of the Hubba Hubba provides excellent interior headroom. Because the tent has a symmetrical shape, two hikers can sit up facing each other with one on each side of the tent. This provides more elbow room than tents with asymmetrical designs that taper towards the foot of the tent. 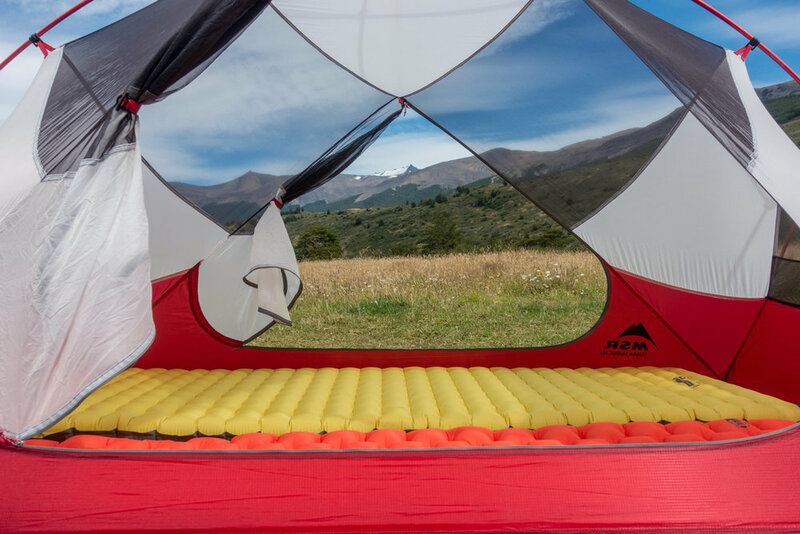 CONVENIENCE - The Hubba Hubba is quick and easy to set up, with a color-coded system to easily align the tent body and rainfly for a proper pitch. ZIPPERS - The Hubba Hubba has excellent zippers on the tent body and rainfly. The main tent body zippers can be operated with one hand and we find that they rarely get caught. The rainfly zippers are also very good, especially when compared to other tents in the same class. Thought they occasionally require two hands, they mostly function without snagging. 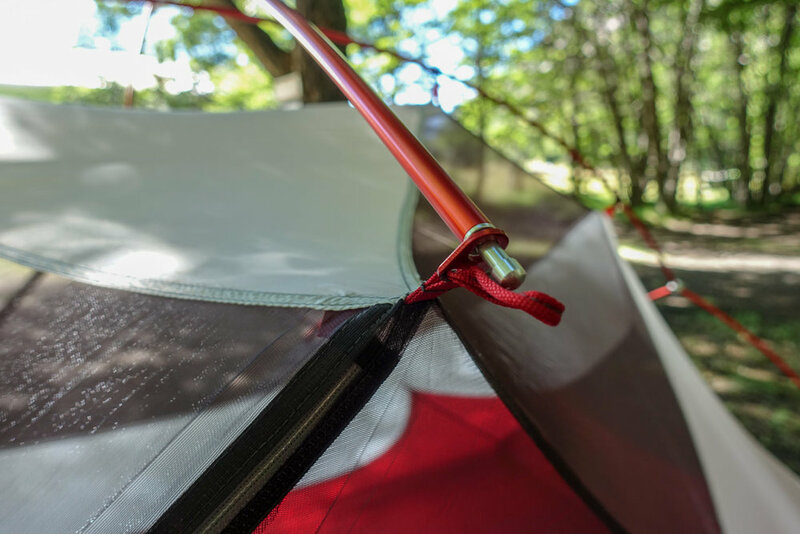 We also love the positioning of the rainfly zippers, which align to the side, so you won’t have to put a hand in the dirt to reach the zippers from inside the tent. VENTILATION - Two size ventilation ports have velcoro supports that increase airflow and reduce interior condensation without letting nasty weather in. RAINFLY DOOR - The rainfly door on the Hubba Hubba can be partially pinned back or fully pinned back for increased ventilation and views. The design is smart and easy to use. In wet weather, rainfly gutters divert water away from the zipper, which helps keep the tent interior dry when entering and exiting. DURABILITY - The Hubba Hubba NX is built with quality materials that provide a good balance between long-term durability and weight savings. 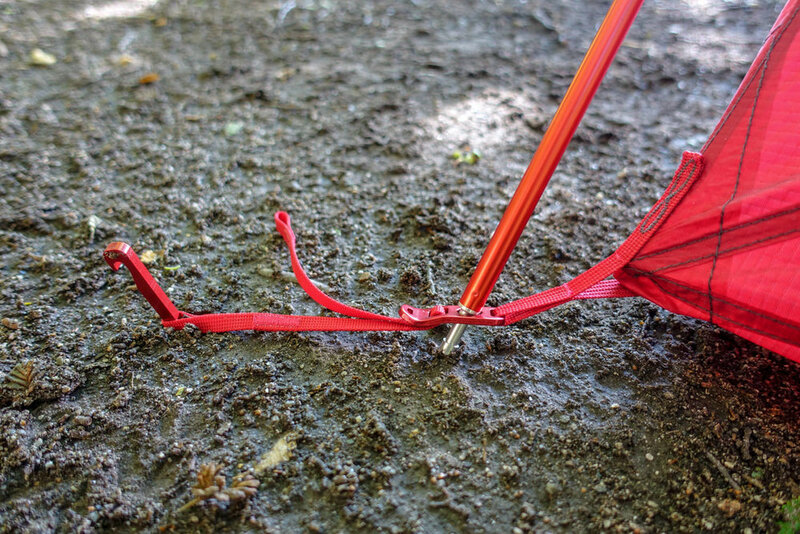 We usually forgo footprints, but if you want to increase tent floor durability, pick up the Hubba Hubba footprint, which is sold separately. CLOSE QUARTERS - Though the headroom in the Hubba Hubba is great when sitting up, the ends of the tent can feel a bit narrow when lying down. For this reason (and like almost all 2-person backpacking tents), the Hubba Hubba may feel a bit tight for 2 people. Those wanting to travel light and willing to snuggle up should stick with the 2-person Hubba Hubba. For those wanting more space and willing to carry more weight, MSR also makes this tent in popular 3-person and 4-person models. TENT STAKES - MSR actually provides 10 tent stakes to match all the corners and guylines of this tent, which is excellent, and well beyond the amount of stakes most tent manufacturers provide. The stakes themselves are only okay though. They’re a bit cheap, have less holding power than 3-sided stakes, and don’t have loops to make them easier to extract. That said, this is a pretty nitpicky detail and we’ve gotten by just fine with the provided stakes. STUFF SACK - The stuff sack for the Hubba Hubba has two cinch straps that help compress it very nicely. Its wide-mouth opening takes a bit of getting used to and requires rolling up the tent before putting it in its stuff sack, which can be a bit annoying in nasty weather. Overall we’re lukewarm on this design, but again it works just fine and is far from a dealbreaker. WEIGHT - In general, we try to backpack as light as possible because we find that it makes the hiking far more enjoyable and allows us to cover more miles using less effort. In that vein, the Hubba Hubba NX is a bit heavier than we would generally prefer, but it’s still among the lightest freestanding backpacking tents, and isn’t bad at all when split between two people. INTERIOR POCKETS - Though the pockets on the Hubba Hubba are decent and useful, there are other tents in its class with more pockets and smarter pocket designs. Overall we feel that the MSR Hubba Hubba NX is an extremely well designed, durable, spacious and smart tent that provides excellent protection in windy, wet weather. We consider the Hubba Hubba one of the best backpacking tents on the market and highly recommend it. Our two main complaints with the Hubba Hubba are that it’s a bit heavier than we’d prefer (though still among the lightest double-wall, freestanding tents) and the interior space can feel a bit tight for two people when lying down. Overall, the pros of the Hubba Hubba heavily outweigh its cons and it ranks squarely among the best backpacking tents for dependable protection and comfort. Check out our Best Backpacking Tents List to see how the Hubba Hubba stacks up against the competition. We were provided a testing sample of this tent but we are under no obligation to give it a positive review. Some of the links on this page are affiliate links, which means we may receive a small commission if purchases are made through those links. This adds no cost to our readers and helps us keep our site up and running. Our reputation is our most important asset, which is why we only provide completely honest and unbiased recommendations.